Articulation: Balljointed ankles, swivel/hinge knees, swivel thighs, swivel/hinge hips, ball jointed abdomen, swivel/hinge shoulders, swivel/hinge elbows, balljointed wrists, and a balljointed head. Accessories: Pickax, pitchfork, knife, machete, spear, 2 interchangeable portraits, campfire w/ removable flame, and Pamela Voorhees' head. 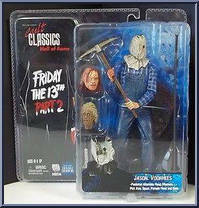 * NECA created an all new body for this version of Jason as his outfit in Friday the 13th Part II is completely different than anything else he wears in the series. I watched the film within a few hours of writing this review and I think I can say with certainty that NECA did a pretty good job of capturing the build and fashion sense of this version of Jason. The paintwork on his plaid shirt is very clean and sharp while the sculpted denim of his overalls is quite lifelike. This is easily the version of Jason from Part 2 to top right now. * The new body allows for way more articulation than the previous Part 2 Jason figures released over a decade ago. Like the previous Ultimate Jason figures, Jason has a nice amount of articulation that allows you to put him in a variety of camp counselor slaying poses. He feels nice and solid and is another testament to how NECA's design and quality have progressed over the years. * The first headsculpt included, and the main one that you'll probably use, is this head. Covered by a burlap flour sack (that gave actor/ stuntman Steve Daskewisz rug burn after extended wear). It's a pretty cool portrait and NECA did a nice job at making the bag looked aged and kind of filthy. The single eye gazing out is really well done, too. Pretty spooky! * If you prefer your Jason to be running around unmasked (like in the "probably just imagined by the main character" jumping through the window scene at the end) then NECA has you covered. Behold: Unmasked Jason! The sculpt definitely is rather grotesque and matches well the appearance in the film. I believe this is a reuse of the headsculpt that came with the original 2006 figure and while it might be a bit short of the modern work NECA is producing, it is still really, really good. * Jason comes loaded with sharp, pointy things. First up is a butchers knife that reminds me of the knife Michael Myers used in Halloween. Jason only uses this one time and it is to stab Vickie after she finds the bodies of Jeff and Sandra. It's a solid sculpt with nice paintwork that just makes it look wicked. I get chills just thinking about this thing. * I always equate Jason with machetes and here we get a machete for Jason to wield. Jason uses this curved machete to kill both pervy Scott and nice guy Mark, Scott by slitting his throat while he was hanging upside down in a snare trap and Mark by just flat out hitting him in the face with it and then sending him rolling in his wheelchair down an outdoor staircase. The paintwork is pretty well done here as well, and even features some blood splattered on the blade. Is this possibly Jason's blood, since Ginny slashes him with it too? * To add to the rogue farmer vibe he has going in this film, Jason also carries around a pitchfork. He doesn't kill anyone with it that I remember but he does use it to terrorize Ginny and Paul during the final act. It seems a bit smaller than would think but maybe that's just me. I have little to no experience with pitchforks in real life. * The pickaxe is another weapon that Jason doesn't use to kill anyone (although he does wound Ginny with it). It's another cool, sharp looking accessory and it features some blood on the end. Pickaxes, man. Yikes! "story" of Jason while Ted leaps with the spear and wearing a mask to scare them. The spear just sits around, like Chekov's gun, until Jason uses it to impale 'hat wearing' Jeff and 'can't follow the rules' Sandra at the same time. Double yikes! * Technically this set comes with three heads, but only two of them are for Jason. The third is the head of Pamela Voorhees which is an accessory that you can just keep hanging around somewhere. It's a spooky looking thing and it fits well in either a refrigerator or on an altar in a makeshift cabin in the woods. This is a gruesome looking thing and NECA did a great job with it. It's pretty creepy! 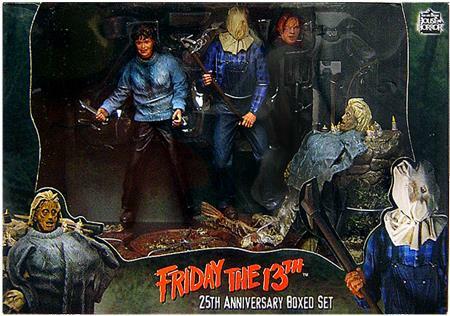 * To really round out this set NECA included a campfire. The sculpt and paintwork is awesome here as it looks like a real fire pit with a ring of rocks and a pile of firewood neatly arranged for maximum burnage. But wait... it gets better! * There is a translucent plastic fire effect that fits over the logs to effectively give us an action figure scaled campfire. Cool, right? This is a really neat extra and it definitely feels like the kind of accessory that collectors not even interested in the Jason figure would want for their collection. This is a well done extra! * My figure is not broken, so don't worry. I just wanted to point out that Jason's right leg, at last on mine, can pull out if its socket rather easily. It goes back in but this could be a minor annoyance. We'll wait and see. While I'm not the biggest fan of this series of movies, I still can't help but want to have action figures of Jason around. Even though Michael Myers is my favorite Jason still comes across to me as the definitive movie slasher. If I ask someone to describe a movie slasher it'll probably be "big hulking guy, old clothes, hockey mask, carries a machete." NECA is doing an excellent job with their Ultimate releases and This version of Jason Voorhees from Friday the 13th Part 2 is another solid entry. He's an Epic toy with full articulation, five weapons, two heads, and the impressive campfire and Pamela Voorhees head accessories. Scoop him up if you're a fan! If you need more Jason Voorhees in your life, I've reviewed the Funko ReAction Jason Voorhees from the ReAction Horror Series and the NECA Ultimate Jason Voorhees from Friday the 13th Part VI.